Less than 9 months after arriving in Second Life, Skribe Forti has positioned himself as a specialist producer of mixed reality video, with at least three international brand names on the showreel. This week he produced a promotional video for the CSI Second Life episode. Detective Matt Taylor enters the virtual world to chase (guess who) a real life killer. 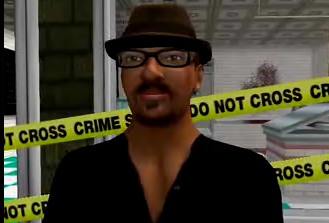 In conjunction, as can be seen from the video, a be-your-own-detective game has been created in Second Life. Around 100 islands were created in Second Life to accommodate the expected hoards of newbie detectives that a high profile TV show might generate. In the event, sign-ups were perhaps less than what they hoped for. 74,000 so far. As soon as they stop watching television they’ll be right over. Electric Sheep Company, who did the Second Life work for CBS made a pretty good fist of the orientation experience given that they’re trying to simultaneously explain Second Life and the CSI game. That’s a big ask. They used the occasion to released a customised Second Life client, On Rez. It’s cut-down in functionality and slightly less intimidating than the real thing. Orientation in the broad sense is still way too complex – 90% of arrivals fall by the wayside. I have some ideas on how this could be improved. (Tell someone who cares, Bret). CBS actually invested $7 million in the Electric Sheep Company, a competitor of ours, earlier this year. A CBS VP is quoted in that article: “We believe that all these virtual worlds represent next generation communications platforms”. I think that’s fair comment. I quoted an education blogger at the Perth Podcamp today. He had just attended a Second Life Education Conference. “There are those rare occurrences where in the moment, you can feel a change, you can feel a complete shift. The past 24 hours I bore witness to that rare moment where you literally witness the shift happening in front of you and know things are never going to be the same from this point forward”. That’s an epiphany common to many educators. The entertainment industry’s interest in Second Life guarantees the virtual world more high profile media exposure. The tech industry are highly engaged and the education sector is very active and very excited. These three sectors are the main game. Interesting that 100 islands during the launch of the episode became 4 islands a week later. Obviously Linden Lab offer a flexible island overflow for developers launching projects with large scale media potential.